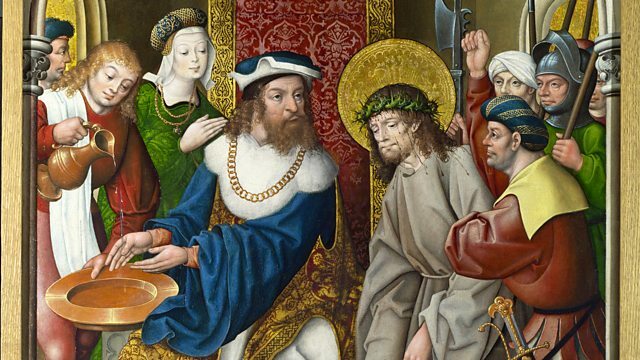 Writer Kit de Waal seeks out a painting at the National Gallery showing Pilate washing his hands of his part in Christ’s death - and it brings back painful childhood memories. The writer Kit de Waal grew up a Jehovah’s Witness, and it was not a happy experience for her. The painting at the National Gallery she has chosen for her Essay is the 16th-century Christ Before Pilate by the Master of Cappenberg, sometimes identified as Jan Baegert. It captures the moment when Pilate, the Roman prefect, tries to wash his hands of his part in the death of Christ. For Kit, this is a poignant reminder of the sense of not passing muster in God’s eyes which she was carrying for much of her life – and a chain of ritual disavowals running through her own family history.